Many organizations face mainframe challenges—decades-old mainframe-centric application portfolio is expensive, monolithic, rigid, and slow to evolve. Blu Age customers in sectors such as banking, insurance, and government built their IT based on mainframe technologies from the 1970s, 80s, and 90s. These systems were further complicated in the late 1990s and early 2000s by the addition of client/server layers to the mainframe core. The complexity of these architectures combined with the cost of removing technical debt helps explain why there are still hundreds of billions of lines of COBOL code being maintained today. It also helps explain why businesses are constrained and limited by their own legacy mainframes. Mainframes host valuable assets such as processes and rules, data that can fuel innovation, and core-business value—if only they are agile and lean enough. So how do you transform mainframe assets to suppress technical debt, cut costs, and remove inefficiencies? In other words: How do you migrate mainframe assets to Amazon Web Services (AWS) in order to combine both the value of core-business IT assets and the value of AWS? Blu Genius is a legacy-COBOL-to-Cloud portal powered by Blu Age Velocity. It automates the transformation from mainframe legacy languages, databases, and file-systems to agile service-oriented applications on AWS. There are several mainframe migration options that can be evaluated based on speed, agility, cloud maturity, and business value. Re-host uses an emulator to move, translate, and recompile legacy applications on AWS. It keeps the original COBOL code mostly intact, but it’s not a simple lift-and-shift. Rather, it’s a complex re-platforming project where the COBOL code is tailored to a permanent third-party emulator, and then adapted to many third-party utilities for output management, sorting, printing, data storage, and charge-back. Furthermore, re-host does not take advantage of micro-services, elasticity, or service-oriented languages like Java or .NET, and it cannot easily integrate with cloud-native applications or AWS services for big data analytics, artificial intelligence, or mobile enablement. This type of transformation can reduce operating expenses but is best suited if legacy applications are close to the end of their product lifecycle. Replace is an approach where the legacy mainframe application is replaced by commercial off-the-shelf (COTS) software. Finding a COTS solution that covers 100% of an organization’s business needs is difficult, requiring an exhaustive list of requirements, use cases, and business rules. This typically leads to the development of custom code for equivalent functionality, similar to risky and time-consuming manual re-write projects. Re-write refers to the manual redevelopment of legacy code in a newer language, and it’s not easy because of the need to retroactively specify all software requirements. It’s difficult to certify the completeness and accuracy of the retroactive specification, making like-for-like testing nearly impossible. Furthermore, legacy mainframe applications, especially COBOL batch processes, are designed to make the most out of scarce compute resources, requiring deep technical knowledge and appropriate tooling. A manual rewrite can take many years to complete, increasing risk and reducing the overall business value proposition. Automated refactoring addresses an organization’s need for speed, accuracy, and agility of the transformed application. This process extracts the application model from the source code and refactors the model to the desired target architecture, forward-generating new object- and service-oriented code. The new code eliminates technical debt, taking advantage of popular application frameworks such as Angular and SpringBoot combined with AWS-managed services such as Amazon Aurora, Amazon ElastiCache, or AWS Elastic Beanstalk. Typically, the resulting architecture of an automated refactoring effort executes on Amazon Elastic Compute Cloud (Amazon EC2) instances or Amazon EC2 Container Service (Amazon ECS) containers. 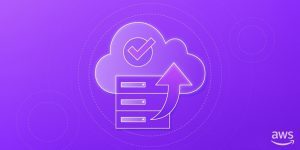 Data can be hosted by Amazon Relational Database Service (Amazon RDS) and Amazon Aurora for both relational database managers (DB2 z/OS, Datacom) and modernized legacy file-based data store (VSAM, SEQ). Elastic Beanstalk can automatically manage capacity provisioning, load balancing, and automatic scaling of compute instances. Mainframe in-memory distributed data structures can be stored in Amazon ElastiCache, and after automated refactoring the resulting micro-services are accessible directly via the Elastic Load Balancer. They can also be accessed asynchronously via Amazon SQS or as an Application Programing Interface (API) via Amazon API Gateway. The mainframe batch programs can be submitted and dispatched with AWS Batch. Figure 1 – Mainframe Automated Refactoring on AWS. Automated refactoring is agile with a flexible automation process, creating a customizable AWS cloud-native application architecture. It’s modern because generated code leverages popular frameworks such as Angular and SpringBoot. It’s versatile with a large variety of legacy languages such as COBOL or PL/1 transformed into desired AWS-ready Java. It’s simple, as no prior knowledge of legacy languages is required. It produces quality code and maintainable code with measurable metrics. And it’s fast with automated refactoring being much quicker than a traditional manual re-write and about as fast as COBOL emulator re-host projects. Blu Age Automated Refactoring software extracts all functional features and business rules from the legacy mainframe source code and rewrites them automatically in digital- and cloud-ready architecture. It also includes data and database migration for continuous testing. Blu Age Analyzer creates an application model from the source code, facilitates the allotment for the modernization project, and allows for planning phases and budget. It collects and analyzes information from the source code assets, data structures, use cases, and functional interdependencies. It provides various graphics and tables that present program calls, control flows, dependencies, metrics, optimization suggestions of the legacy source code, and data structure in order to simplify maintenance and improve performance. Based on actual dependency analysis, Blu Age Analyzer decomposes applications into subsystems to solve inter-programs dependencies as well as deployment data dependencies. This assessment of the legacy portfolio provides key elements for understanding the modernization scenarios. It enables a complete screening of the legacy applications to accelerate and secure modernization projects. Blu Age Velocity expedites automated refactoring and lowers the cost with a pre-selected target software stack based on Java, AngularJS, SpringBoot, Spring Statemachine, and REST APIs. All transformation options are calculated in advance and driven by Blu Age Analyzer. Import legacy code in Blu Age Analyzer and tag programs and data structure to define relevant work packages. Export tagged artifacts to Blu Age PLTC (COBOL 2 SpringBoot) to extract functional specifications from the work packages to UML models. Generate Angular/SpringBoot base code from UML models. Package Java code using Maven and NPM. Export legacy data to the modernized data structure and load it on the targeted database such as Amazon Aurora. 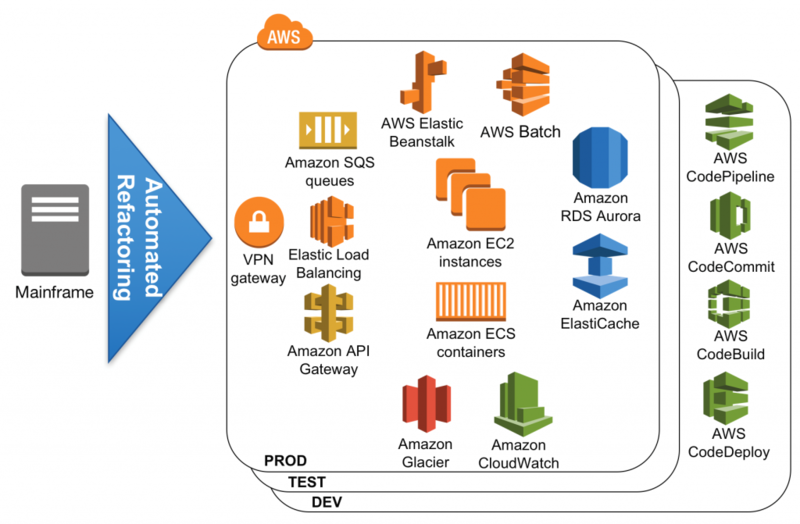 Deploy the packaged applications on the desired AWS services. Run functional tests for acceptance. Check code base compliance to the requested quality rating. Steps 2 to 4 are fully automated and can be integrated within a DevOps pipeline with Blu Age Velocity silent version. This automated transformation guarantees functional equivalence even for complex Mainframe batch processes. Figure 2 – Blu Age Automated Refactoring process. Customers benefit from COBOL applications being transformed by Blu Age automation into cloud-native applications in as little as 6-8 months (SIT and UAT included). The Blu Age Velocity platform accelerates the conversion even further; on average, 1 million lines of COBOL code can be transformed and tested in one month. Prices range from $0.10 to $2.00 per LoC utilizing onshore resources, depending on architecture, language, and scope of services. Blu Age software produces code with high development quality standards, which can be measured daily using SonarQube or CAST software, and which can be maintained without the use of Blu Age tools. Blu Age’s high level of automation allows the adoption of DevOps Continuous Integration Continuous Delivery (CI/CD) pipelines and a more rapid integration with AWS services. Because the legacy design is transformed into modern language service-oriented code on AWS, customers also benefit by eliminating technical debt being, allowing mobile-friendly web interfaces to improve user experience, leveraging AWS elasticity, and replacing mainframe capital expenditures with pay-as-you-go operating expenses. Blu Genius can be used by customers in any industry, for any mainframe executing languages such as COBOL (including most of its various flavors), JCL, and subsystems such as CICS, IMS, and VSAM. Customers engaging in complete legacy automated refactoring require appropriate technology and methodology. To perform complex transformations, the Blu Genius Portal manages necessary activities from legacy code base inventory and analysis to control of like-for-like business logic testing and compliance with the latest development standards. The portal is available for customers and partners on AWS. You can try Blu Genius live and for free with preloaded code and data samples by registering at blugenius.com. We also have Blu Age references, and you can contact us at blugenius@bluage.com.